Food is more than just nourishment. Food is more than just about taste. Food is also culture. How you eat something is often, or not, connected to the culture you’re from or live in. People who eat with their hands are a world away from people who have a specific set of cutlery for each part of a meal, or people who eat in wooden utensils.We shouldn’t judge each other on what we eat and how we eat it. Right? Well, there are always exceptions to every rule. Australian Prime Minister Malcolm Turnbull created a bit of a sensation recently on Instagram. No, he wasn’t doing the Kiki challenge or taking a selfie in a compromising position, he was eating a pie — with a knife and fork. Shocking. Understandably, rightly so the Internet didn’t let it go. And though I’m often against online take downs, I really can’t blame them. Anyone who ever grew up in Australia or New Zealand will know that this sort of behaviour is unacceptable. In fact, I would go as far as to say that it’s practically barbaric. When I first moved to New Zealand at the age of twelve, my understanding of a pie was basic. A large circular piece of pastry with an apple or custard and peach filling. A pie was a dessert. However, I found that New Zealanders and Australians have a completely different take on the definition of a pie. Imagine my initial surprise and eventual delight upon discovering this new breed of pie wasn’t only miniature in size but also savoury. No larger than the palm of your hand, and filled with hot, appetising goodness, they quickly became a favourite. 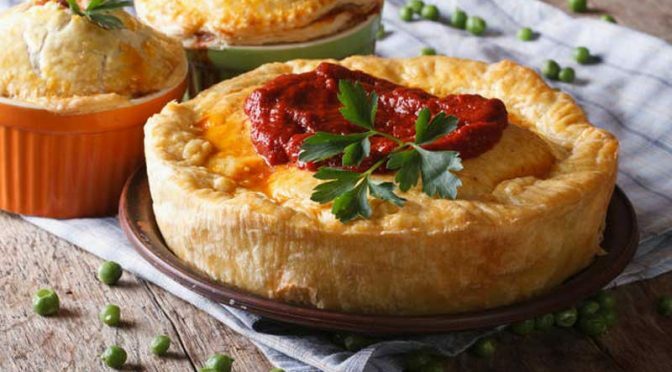 Classic pie flavours include, steak and mushroom, the potato top (a mince pie with a mashed potato crown), and my ultimate favourite: mince and cheese pie. There are also chicken pies, and over the years, more interesting hybrids such as butter chicken and chicken tandoori pies. No matter what flavour of pie you prefer, there is nothing better than a pie in one’s hand in the middle of a New Zealand winter. It’s everything. I was introduced to pies in high school. Every day at lunch, there was a long line in front of the tuck shop (also known as a cafeteria in other parts of the world) where students were waiting to purchase a pie for $1.50 or a $1 hot giant cookie also known as Cookie Time. I really can’t go into the details of what Cookie Time cookies are right now without salivating over my own words. They deserve their own story. But for $1.50, pies were cheap, filling and delicious. One thing I picked up on very quickly was that the way in which people ate their pies affected not only the taste (we could argue whether or not that’s actually true) but also the whole pie-eating experience. I noticed that everyone ate their pies out of their plastic coverings, or out of their little brown paper bags — and with their hands. They would hold the pie with two hands, press down at the bottom end, which pushes the filling out in the front where one would then bite it off along with the pastry. Sometimes, it doesn’t hurt to have your sauce of choice (I prefer ketchup) smeared on the area you’re biting from. I’ve never questioned this technique of eating a pie because, first of all, it works. Second of all, any other way would defeat the purpose and means of the third reason which is, it tastes better when you eat it this way. Students, teachers, doctors, plumbers, DJs, socialites, fashion designers and their models — all of them eat a pie in this way. It is the common denominator. There are many reasons why one should visit New Zealand — the scenery, the people, the culture, but the pies are legendary. However, please, don’t embarrass yourself, don’t be like Australian Prime Minister Malcolm Turnbull and insult a whole nation by assuming that you can eat all foods with a fork and knife. 1-What is this thing then? 2-How do you eat it? 4-Who says it’s Australia’s national dish? 5-How often do people eat these pies?